This continues to be a bit of a treat. Holmes & Watson dig deep (literally) to uncover foul misdeeds, a mysterious Elizabethan street underground, and revenants galore. And Steam punk Commandos. It’s great – action packed with fruity Victorian dialogue and a Holmes / Watson relationship that never strays far from the traditional / accepted version, but still manages to be sparky and lively. Ian Edgington writes lively Victoriana / Steam punk fiction with effortless ease (see Stickleback for a case in point), and his wit and lively mind are well employed here. Fabbri’s illustrations are the perfect accompaniment, easily conjuring up the gaslight and murk of London. 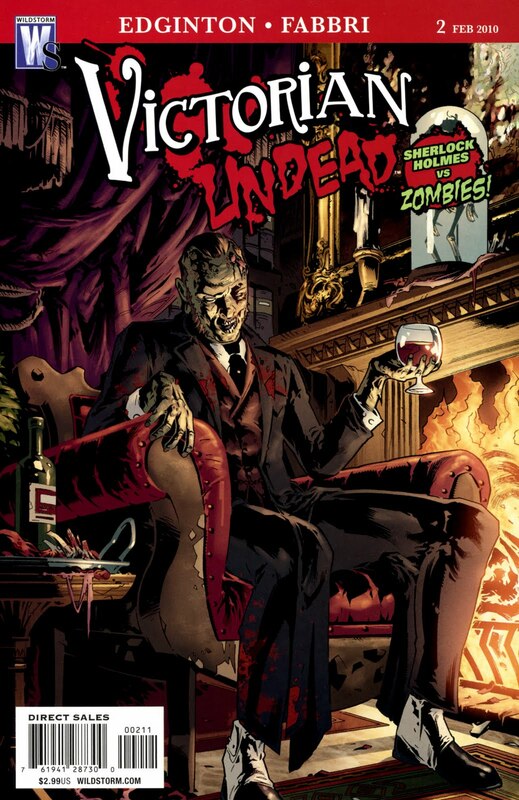 The ending is handsome, setting up issue 3 with a tantalising glimpse of the brains behind the Undead. More excitement to come, no doubt. No signs of fatigue in this issue. I love it.